The children who participated in the latest Bicycle Rodeo and Safety Clinic by the Buffalo Grove Police Department briefly learned another reason to wear a helmet. It can protect against hail. Despite poor weather, the bike safety event this year drew its largest crowd ever. Sgt. Tony Goldstein said this event edition benefited from another event. The public works department hosted its annual annual touch-a-truck event at the same time. The bike clinic ended up attracting 95 bike-riding youths. "We sent people over there, and they sent people over to us," Goldstein said. "It felt great. We saw kids smiling and learning about safety." 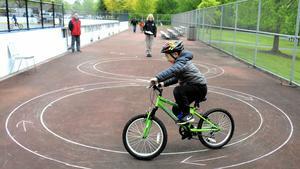 Young participant navigates a figure eight May 12 during an annual bike safety event hosted by the Buffalo Grove Police Department. (Michael Schmidt / Pioneer Press) The rodeo involved a bicycle-riding obstacle course, set up at the Busch Grove Skate Park, to teach young riders about balance, maneuvering, emergency braking and more. The Wheeling Wheelmen, the adult riding club in Wheeling, helped participants fit their helmets correctly, and the Continental Restaurant supplied free ice cream. And the hail only lasted 30 seconds, Goldstein said, falling at the beginning of the day. Goldstein said that in the future, he would like to move the event closer to public works department's touch-a-truck, but he did not yet know whether a facility could host the obstacle course. Regardless, he said advertising improvements on social media and temperature could lead to new record attendance in 2017. "With the poor weather, things can only get better," he said.